Hi everyone! Sorry for my absence—life’s been a bit hectic, and I’ve been taking time to unplug and be more “present” with friends and family. Visited my mom this past weekend in San Antonio, and my father-in-law’s tumor has shrunk to a 1/3 of its original size since the cancer treatments started. My whole life perspective has changed in 2017. Family is everything, seriously y’all. What hasn’t changed is living in the apartment (7 more months to go! ), and truthfully I’ve lived longer in apartments than I’ve lived in a house, and I’ve learned a few things. Today I’m sharing my top 3 renters’ hacks for the living room as part of a series developed by Kathy from Up ToDate Interiors. She is a MASTER of making a rental look magazine worthy, and I love keeping up with her adventures as she lives abroad in Japan. We’ve been in this apartment for 5 months, and there’s been a few things I’ve done that have made this space feel chic and cozy. 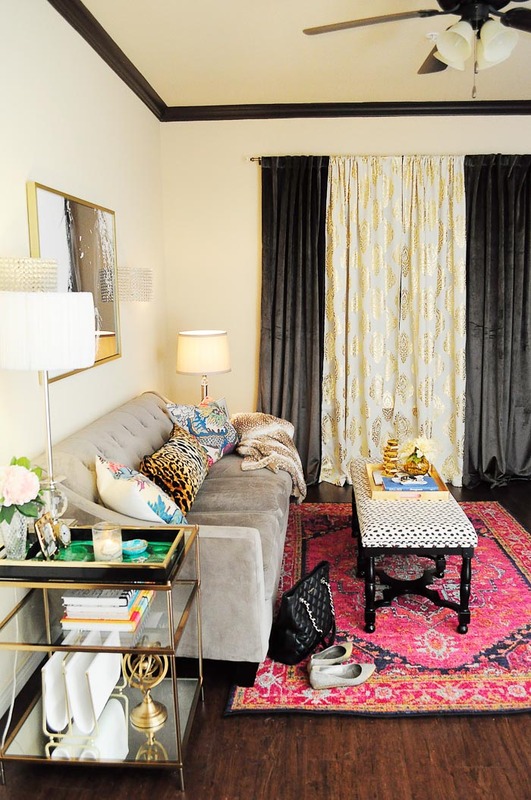 All of these ideas are definitely renter friendly and can be looked at as small space solutions. In the house, we had a huge sofa that we sold before we moved, and we opted to keep the Chloe sofa from Macy’s (no longer sold, but this one is nearly identical and under $500!) that had been used in our former dining room for our apartment rental. It’s small scale measurements, but large scale style, make it a great piece for our very small living room. Lots of companies are embracing the “tiny” movement in terms of homes, so you can find smaller sofas at places like Pottery Barn and CB2. However, Target, Overstock, and Wayfair also have super affordable options. Picking a properly sized furniture piece like a sofa for a rental space can give you more room, style and options for how to arrange your space. So, if you have a large piece of furniture and you’re moving into a tiny rental, you may consider selling it to buy something more to scale. If you all have read my blog for a long period of time, you all know I’m not a huge fan of gallery walls with a bunch of random items—seriously, they give me hives. I think they look fabulous in some homes, but for a small space or a rental, simple is better (plus you’ll likely keep more of your security deposit the less you drill into the walls). 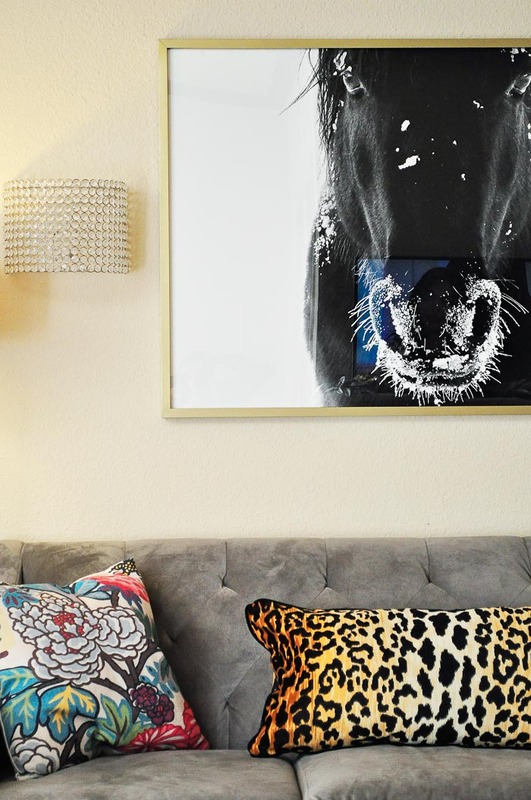 In my living room, I opted for a large scale black and whitehorse print from Minted centered over the sofa. 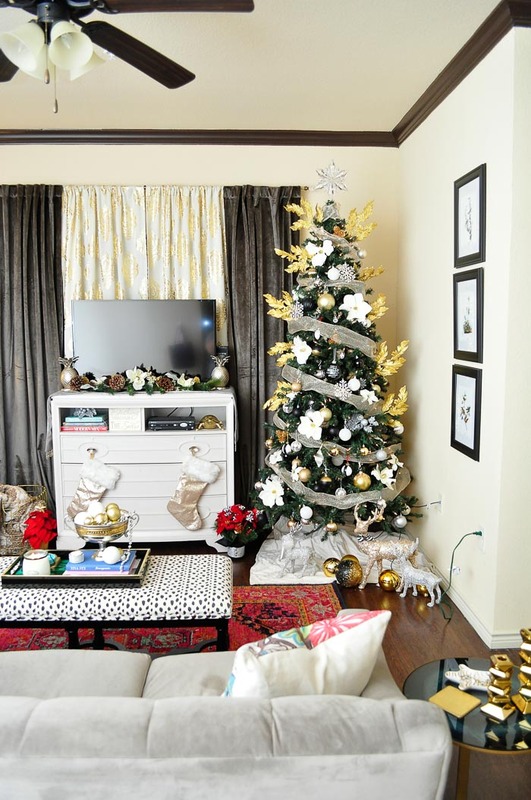 It’s a statement piece for the whole space, and it isn’t visually busy. My overall point is to make an impact with fewer art/décor pieces on the walls so your space still feels airy and not like it’s caving in on you. Tip 3: Sometimes you must cover windows! Then I put a TV stand in front of the area. Gulp. Honestly, unless your windows offer a fabulous view, I say covering them up for the sake of more furniture arrangement options is ok. My windows overlook the parking lot and would give us zero privacy if opened. I initially chose a pair of velvet curtains from HomeGoods (you can snag similar ones here) paired with some metallic damask linen-type curtains from Better Homes and Gardens to create my “wall”, but I think I’m going to freshen up the look by taking down the heavy velvet curtains, moving the metallic damask ones to the sides and inserting some sheers in the middle to lighten it up a bit for spring décor. I hope those 3 tips give you some inspiration for how to freshen up your rental spaces and keep them feeling airy, chic and more “yours”. 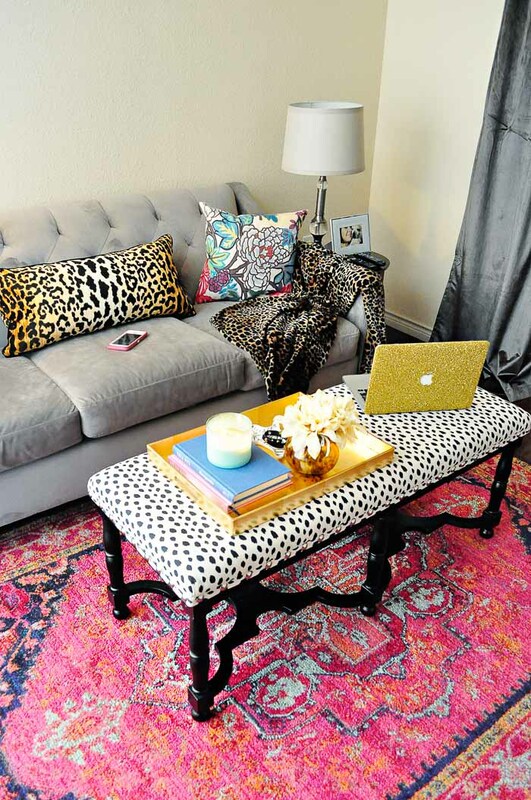 You can view more renters’ hacks for your living room via the links below. 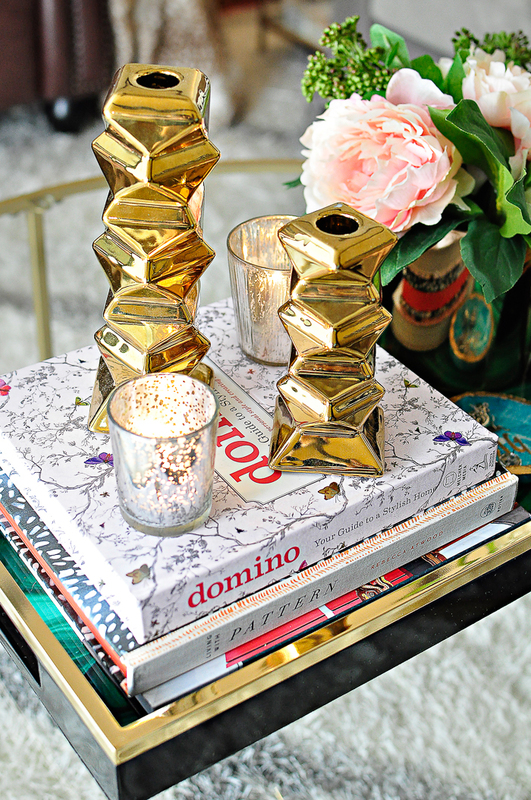 I also have a recent post on how to style your coffee table and an older one on how to style an end table if you need more décor ideas. This week I’ll be working on sprucing up our small patio, and I hope to share that with you all over the weekend. xo! I am coveting that horse! lol I am new to your blog but just subscribed because of your style sense. I have a piano bench that I was thinking of painting in a fun high gloss color and covering the top with foam and fabric. Now after seeing your "coffee table," I think it'd be a fun piece for my living room. Great tips! I am starting to feel the same way about gallery walls, but watch me put on in my sons room. lol. I also love that art piece from minted, so divine! These are great tips Monica! I have same sofa in leather and the scale is perfect for rental living. Love the impact of a big art piece rather than a gallery. It looks so much cleaner! Thank you so much for being a part of this series. 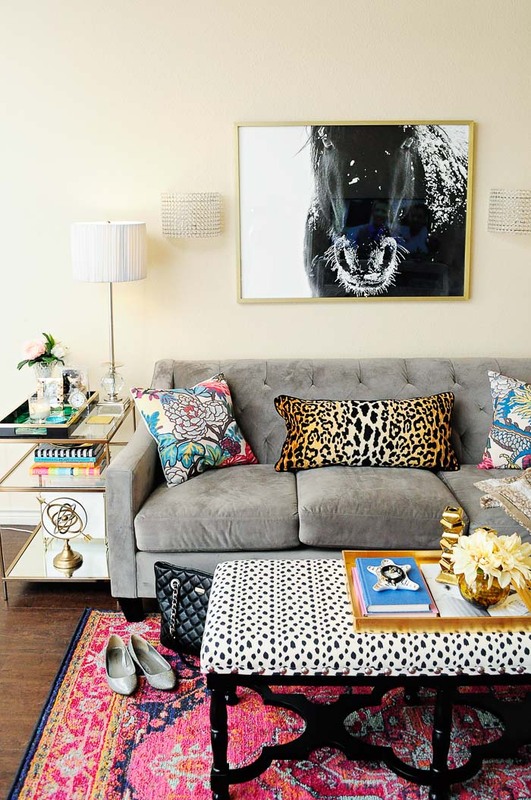 Monica, your living room is gorgeous! Great tips too! Especially the one about using appropriate size furnishings. Even Pottery Barn has a new line out just for small spaces.